We are catering to the requirements of our clients by offering a pure range of traditional incense sticks. The Traditional Series collection of incense has a chest of rare and exotic fragrances which is the traditional favorites for incense lovers worldwide. Enjoy the magic of nature captured traditionally for hundreds of years. Here Traditional incense sticks plays a vital role. 7 Powers is a approach which is used for traditional ceremonies within temples for creation of purifying effect in the atmosphere that has aided meditation. 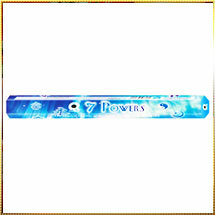 When you will burn these 7 Power incense sticks, you will feel pleasant fragrance coming out. These incense sticks are used widely for used for enhancing the smell of a room and even as lighters for fire crackers.